DeVito at the San Diego Comic-Con International in July 2010. 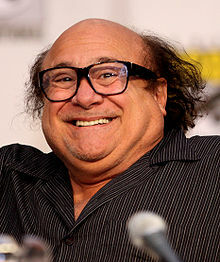 Neptune Township, New Jersey, U.S.
Daniel Michael "Danny" DeVito, Jr. (born November 17, 1944) is an American actor, comedian, director and producer. He has starred in and directed a number of movies. DeVito is of Italian descent. He was born in Neptune Township, New Jersey and grew up in Asbury Park, New Jersey. This page was last changed on 16 April 2019, at 23:46.